Five Girls – sister restaurant to Five Guys? It’s no secret that the structure of Sailor Moon is based off of the long-running Super Sentai1 series, and more generally on the entire tokusatsu2 genre. I mean, the series even got it’s own tokusatsu live-action series in 2003. 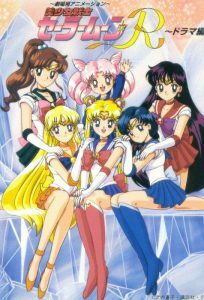 Even the title of the series itself – Pretty Soldier Sailor Moon – follows the long-established naming pattern for these types of shows. As any fan3 of the long-running Super Sentai (and related) series can tell you, there’s a formula that’s pretty strictly adhered to in the formation/makeup of the team. In a traditional five-member Super Sentai team, there is always a leader (most often red) in addition to a sub-leader (generally blue).4 You can also see this color adherence in other shows, such as Voltron.5 While I wouldn’t get too futzed about the colors in connection with the Sailor Team, I do think it’s somewhat interesting (notable?) 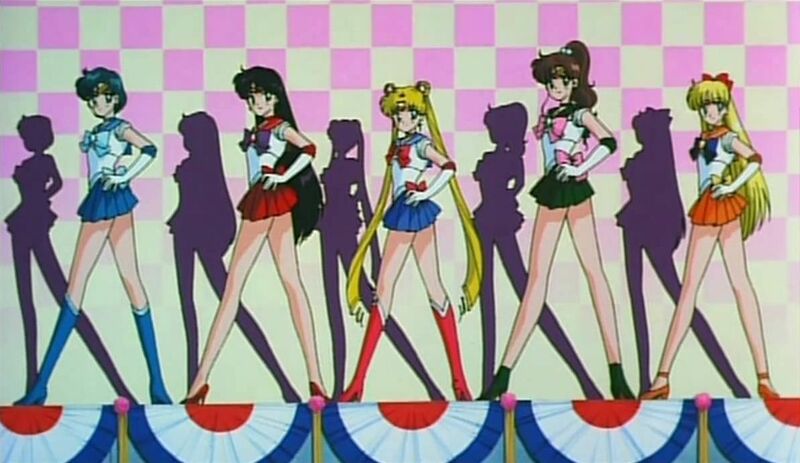 that the first three Sailor Soldiers are red (Mars), blue (Mercury), and red & blue (Moon). So since Sailor Moon is based on this formula, but with a more feminine spin, wouldn’t it naturally follow that there should be a leader? Well, of course… not! In fact, the story of Sailor Moon would be contradictory if there were a strong team leader. And just why is that? Well, in order to answer that, we need to take a look at the villains of the series. After all, the Sailor Team are fighting for Love and Justice, no? So in order for us to know what is “just,” the fastest way is to see what isn’t; i.e., what it is that the enemy is championing. Let’s see how it breaks down in the anime, shall we? So, what’s my point? Good question! Fortunately, I do have one. You see, in each of the cases, the enemy (i.e., what is “bad”) is very hierarchical, controlled from the top-down, and creates an atmosphere of competition and disrespect. Zoisite killed Nephrite, the whole Black Moon Clan was like a dysfunctional family on Thanksgiving, Mimete killed Eudial, the Amazoness Quartet openly antagonized Zircon, and the Sailor Animamates were generally always putting each other down. The Sailor Team, by contrast, was heavily focused on the idea of working together, on team work, and complementing each other’s weaknesses with their own strengths. Sailor Mercury may be weak, sure, but she had the unique ability of keeping the enemy distracted, finding their weaknesses, etc. Sailor Jupiter could bring to the table raw physical strength when needed, while Sailor Venus had experience as a Sailor Soldier on her side to allow her to keep her wits when things were going wrong. The “Now, Sailor Moon!” moments weren’t because she was necessarily the most powerful or because she was the Princess. It’s because healing the enemy is something that Sailor Moon can uniquely do. You’ll notice that while she tends to end the fight, her other methods of attacking (such as her tiara/boomerang/frisbee) take a backseat as the series progresses. I know that there are a lot of different opinions on this subject, especially when it comes to the obvious fact that Sailor Venus was explicitly declared to be the leader of the Sailor Team, but personally this has never quite sat right with me. In a story about love, friendship, and the concept that “the whole is greater than the sum of its parts,” the idea of having a team leader seems to be at odds with all of that. Especially in light of how the antagonists are structured. But that’s just my opinion – I’d love to hear yours! What do you think about the idea of a leader of the Sailor Team? Do you think that Minako was the leader in the anime and manga? How about the idea of Rei taking over, which was briefly touched on in the first season? And that doesn’t even begin to go over who is in charge of the Outer Senshi. Let me know! I always love reading the comments. ← Why Were Both Queen Beryl and Luna Voiced by Keiko Han? I’m not all that familiar with the Super Sentai genre. Do they not typically have antagonists with similar hierarchies? I’m sadly not all that familiar with the genre myself, but I believe they do… to an extent. I’m not sure if it follows the same pattern of having all of the villains defeated in order (from the lowest-ranking on up). Did you deliberately omit the Doom Tree cast? They come damn near close to meeting these criteria, although I suppose you could parse out where Ail and An fall on the sub boss vs leader continuum. Good catch! I did leave them out because although they fit, they didn’t have a corresponding manga arc. Even though most of this article is pointed at the anime, I still think a lot of it is applicable to the manga as well. To be totally honest, though, the Doom Tree story line is actually one of my favorite. Sorry but I would have to disagree especially since you are making a comparison to super sentai series it’s pretty clear to me that in the 90s anime Moon was clearly the leader of the team. 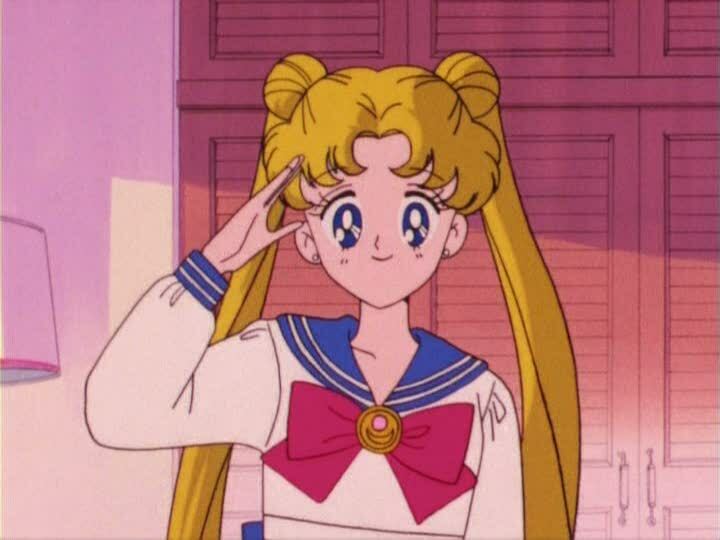 – As you mentioned Rei first mentioned Usagi being the leader early in S1 questioning whether she should be. This sentiment was later echoed by all the senshi in the much despised finale to S2 (an episode DiC dubbed as “Follow the Leader”) in which each of the senshi make their case why they should be the new leader instead of current leader Sailor Moon over a series of flashbacks. 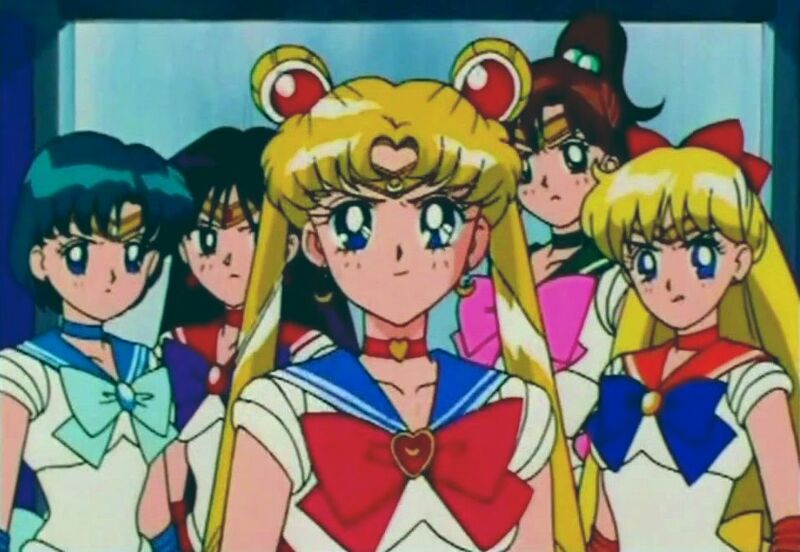 – Sailor Moon stands in the middle and front of pretty much every formation…this is the position almost always occupied by the leader of pretty much every super sentai based team. Seriously just google image search any of them and 99% of the time you can guess the leader correctly by who is most often standing front and center. Heck it expands well beyond sentai teams…even look at the Ninja Turtles, in more images than not you will see Leonardo standing front and center despite just being four of them. – Sailor Moon often is the voice of the team. First of all she is the one most responsible for declaring when it’s time to transform. (Just like the sentai team leader usually does). Next there are the introductory speeches she does (either solo or else she is still the first to speak if everyone has a line). Then there is the fact that she is the one that both friends and foes primarily address. 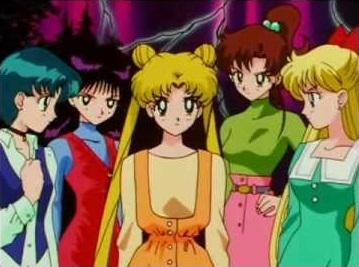 Whether it was Pluto asking for help to save Chibiusa in S2 (the whole group is there but who is she looking at the whole time…Moon), Uranus and Neptune meeting with Moon alone to tell her to stay out of their mission in S3, or Galaxia gloating when the senshi appeared in her lair in S5, etc. She’s also the one to speak up first most of the time with the others following her lead. The first to agree to save Chibiusa, the first to speak up in defense of Hotaru, the first to speak up to initiate the Sailor Planet attack against Nehellenia, etc. – She’s the first one back to her feet when they get knocked down. She was the one who most inspired the others. Again typical sentai team leader behavior stuff. – Look at the enemy pair offs. In season 1 while Mercury, Venus, Mars, and Jupiter each took on a minion DD-Girl Moon was left to deal with their boss Beryl. A pattern similarly repeated when the senshi took on the Ayakoshi sisters with Moon taking on their boss Rubeus. Again in season 3 when the other Inners are stuck battling the Daemon slime the whole time, Uranus and Neptune take on Germatoid, while Moon gets big bad string puller Misstress Nine herself. Once again if you look at almost any super sentai series this fits the pattern of the leader taking on the main boss or a primary minion while the others take on lesser foes in battles where they pair off. Now this doesn’t discount your argument that each of the Sailor Team had their own strengths, but then so too usually do the members of any sentai team. 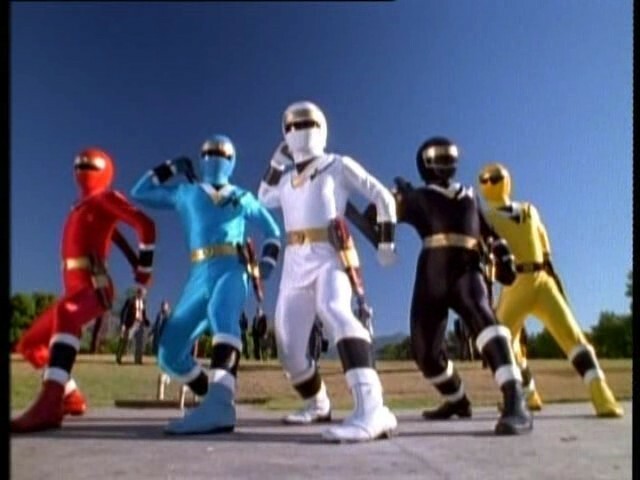 I mean if you go back to the original Power Rangers…Black was the most athletic, Blue was the smartest creating devices and coming up with plans, Yellow was the one who was the most zen and could bring calmness to the others in any situation, Pink was the most acrobatic and the best at finding the good in others. But Red was still the leader the one who had the extra special weapons/power-ups and kept the others motivated. (Although yeah he was also much more of an active directing traffic type leader than the likes of a Sailor Moon too). To be fair, I think we actually agree more than we disagree on this topic of “being leader,” though I think we’re using different terms and probably looking at it a bit differently. A lot of what you mentioned I think falls squarely into a simple matter of Usagi/Sailor Moon being the main character and also the most popular, and doesn’t necessarily imply that she’s the leader. Specifically, appearing front-and-center in a lot of imagery and in all promotions, etc. Taking a page from old anime, Goku always appears right in the middle of all promotional artwork, but definitely isn’t the leader of the team by any stretch (there also isn’t really a team at all, but that’s another point). He’s also the most powerful, much like how Sailor Moon is powerful due to her being Princess Serenity, but in both cases I think that’s more a case of “main character syndrome” and less a sign of their in-universe status. Another example would be the old “The Real Ghostbusters” cartoon. Peter (and then Slimer) was the undisputed favorite amongst kids and fans and is really all you’d see in commercials and headed up most episodes, but he absolutely was not the leader. Lastly! I admittedly know very little about the Super Sentai series, so I consulted with a friend of mine who watches it obsessively. It turns out that there are several cases when red is actually not the leader, but still is featured prominently simply because that’s the way it’s done by convention (a case of separating a character being the star of the show vs. being the leader). “Mirai Sentai Timeranger” is one such case. 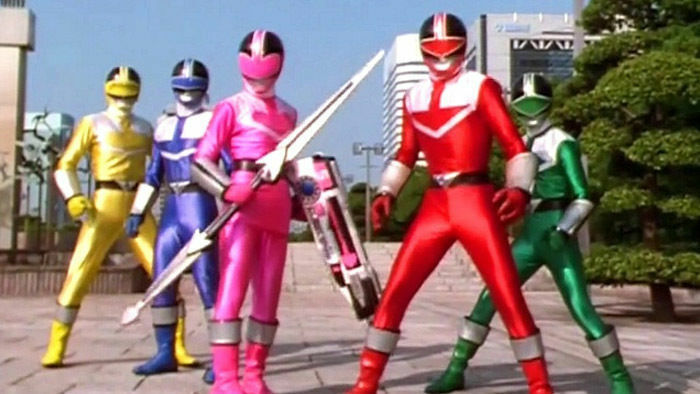 The team is essentially lead by the Pink Ranger. Another case is “Ninja Sentai Kakuranger,” which was lead by the White Ranger — the first female team lead, no less! 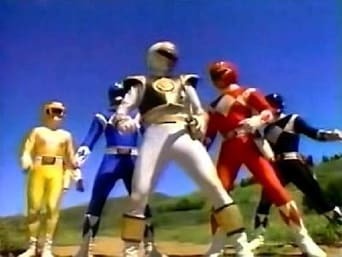 I could be remembering wrong, but I think the Tommy / White Ranger later assumed leadership of the Power Rangers in the American MMPR sometime around the Lord Zedd saga, even though he didn’t become the Red Ranger until…Zeo? Turbo? =p Forgive me, I’m old. Even then, the Red Ranger still took front and center in a lot of promotional posters and even in all transformations. Yeah I guess I shouldn’t have mentioned image searching as that muddied the waters, but I was talking about the episodes themselves. In-universe when the Sailor Guardians appeared or faced down their enemy be it the monster of the week, a henchperson, or a big bad like Nehellenia or Galaxia…that’s what I was referring to as Sailor Moon being front and center in the position that is much more often than not thought of as the leadership position. As for the Super Sentai/Power Rangers stuff….I am in a similar boat of having not watched the stuff for a looong time and really only watched a bit here and there after the original two seasons. Season 3 started to lose my interest and then came the fleet of movies and fly by night franchise changes with characters who barely had time to grab my interest before they were replaced. She definitely does not act like a leader and does not give commands. If anything, Venus is the one that takes a leadership role early on when she first appears (both manga/anime). You COULD argue that Luna and Artemis are the leaders, but, they too are ultimately subordinates to the royal family. I think that, she’s supposed to be the leader, but her style of leadership is teamwork/democracy. She isn’t “ready” to take charge or command. In the Cardian saga, she very reluctantly returns to her duty as a senshi. I believe she understands her strength comes from her support group and relies on them. Once she gains the training and maturity she needs, then she is ready to become Neo Queen Serenity and actually be a real leader. I never really understood the whole ‘Venus as the Leader’ thing either. I mean the only real claim she has to that position, is being the first Senshi to awaken. Outside of that, I never really saw her display any such qualities, or take such a role at any point. I think it was largely down to Sailor-V making her appear as a somewhat more important character. But once Sailor Moon started, Naoko gradually moved away from her to focus more on Usagi. This is perhaps best noticeable in the Black Moon arc. Where she was seemingly set up to do something major, being the only Guardian who wasn’t abducted. But ended up being little more then a third wheel, and ultimately useless. From a western standpoint, I think the average person would naturally see Mars as more leadership material. Due to things like her colour, and possessing a more strict/commanding attitude. Indeed in the Live Action Series, Minako was somewhat grooming Rei to take that role. Though the execution could have been a bit better in that regard. However, I never really saw Usagi as the leader either. To me she’s more like the glue that holds the rest together. She is the reincarnation of a Princess, and the Inners are her personal guards, yes. But let’s remember before that, each of the four were treated somewhat as outcasts. Rei for example was seen as a creepy psychic girl. And Makoto was ostracized for her height and masculine appearance. Usagi was essentially the first person they met who treated them with warmth from the get go. As a result the reason they follow her seems to be based more on affection, then out of duty and destiny. It’s not so much the slandered team dynamic, but more like family/siblings. Usagi is basically the little sister of the group. They tease and sometimes loose patience with her antics. But in the end they all look out for her. If I can make a comparison, it’s much like the set-up for Magiranger. Not to get too sentimental, but Sailor Moon is a series that puts an emphasis on friendship and love. And the Inners relationship with Usagi very much reflects that. The R movie I think best showcases their bond. I see no reason to question as Sailor Venus is the leader of the Guardian Senshi (herself, Sailor Mars, Sailor Jupiter, and Sailor Mercury; I read in their character books that each is the leader after the other is out of commission-in order, Venus, Mars, Jupiter, and Mercury) during the Silver Millenium as there was no Sailor Moon. In present day, Sailor Moon is the leader as she is the Princess. Sailor Venus, however, is still the leader of the Guardians, but is only truly in charge when Sailor Moon is not around. This is seen several times in the manga, even if never actually stated. I read once that Sailor Saturn is the leader of the Outer Senshi, but I can’t find anything to back that up anymore. When all together, Sailor Moon is the leader of all. If Moon is absent, this falls to Venus.